The Collected Shorts of Jan Svankmajer Jan Svankmajer is certainly an attractive man... not that I roll that way mind you... I'm just sayin. 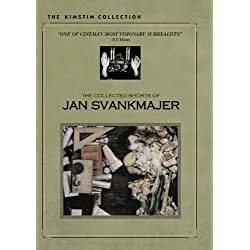 I purchased "The Collected Shorts of Jan Svankmajer" thinking that I would be receiving a few pairs of his worn underpants... perhaps a sampler of boxers, briefs and maybe even a mesh banana hammock or two. Not that I planned on sniffing them mind you.